Please contact us with any information about this MACR, pictures of the servicemen or aircraft. Help support the Army Air Corps Library and Museum including this Missing Air Crew Report Project. Donations can be made with a credit card in any amounts. 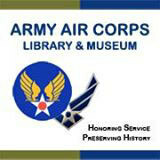 The Army Air Corps Library and Museum is a 501(c)(3) non-profit; your qualifying donations are tax deductible. Do you have items such as papers, photos, uniforms, gear and other artifacts? Read more about Supporting the AALCM.